I’m talking him off the ledge. He owns his own business. A business he started over 10 years ago. A business he now hates. Well, he doesn’t hate the business, but he hates going to work. Every Sunday evening he begins dreading Monday morning. The toll is high. His family bickers constantly. His health isn’t terrific. He’s drinking a tad more than before. He can’t remember the last time he exercised. Or went to the doctor for a checkup. He tells me this isn’t what he bargained for. I tell him, “This is exactly the life you bargained for.” Silence. I thought he hung up on me, but he was just sitting quietly in stunned disbelief that life had gotten so out of control. I sat quietly knowing he’s not alone. Saddened by the fact that I’m encountering too many small business owners who feel owned by their business instead of the other way around. Home offices can be from hell, but so can other offices. 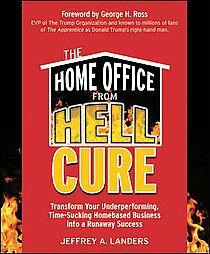 Small, medium and large businesses can be just as demon possessed as a homebased business. They need a cure. And like any other ailment, there’s not a single prescription because the illnesses are varied. Don’t let your small business kill you. Or over-run your life. Today, I’d like to give you just a few simple, but powerful ideas to consider. Hint: These powerful ideas have everything to do with YOU, not your business. It starts with YOU. Would you do me a favor? Subscribe to the podcast. Thanks! Previous post: Episode 108 – Go Small, But Go!